To avoid being perceived as spammy or sloppy when you have a legitimate link to share, check out our list of the five best link shorteners that’ll clip your links into clean, consistent, and clickable URLs. URL shorteners not only trim your links into polished URLs, but they also let you track the performance of your individual links. Some URL shorteners even offer branded link options. For example, a branded link for this blog post would look something like “hubs.ly/url-shorterner”. What are the benefits of using link shorteners? 1. When you post long links on social media, it can look like spam or deter users from clicking on something they don’t recognize. In particular, adding tracking parameters to your links can result in URLs that look long and confusing to someone who’s unfamiliar with typical link tracking practices. Link shorteners can prune spammy-looking links into clear and concise links. 2. Many link shorteners also let you track each of your link’s performance and analytics, which can help you understand which pieces of content perform best on specific platforms. 3. Every social media network limits the amount of characters you can include in your posts. Twitter and LinkedIn have the shortest character limits at 280 and 600 characters, respectively, so if you need to squeeze a link or an extra hashtag in one of your posts, link shorteners can help you stay within the limit. 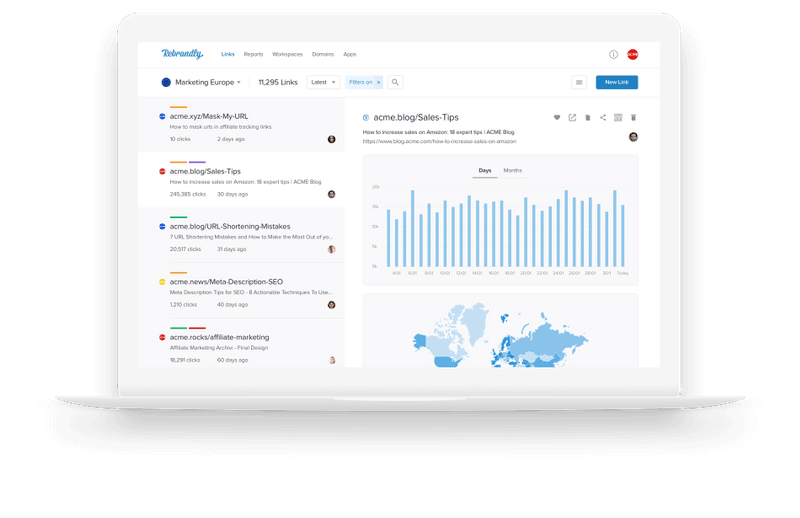 Bit.ly is a link shortener platform that features a comprehensive dashboard that displays your links’ performance metrics, such as click-through rates, channel stats, and geographic information of the people clicking on your links. They also offer branded links and have integrations with social media management software, like Sprinklr, Sprout Social, Buffer, Hootsuite, and HubSpot to help you seamlessly distribute your shortened links through your social media profiles. Bit.ly’s free account offers up to 500 branded links, 10,000 unbranded links, and reporting data about your top referrers, which is ideal for small businesses. 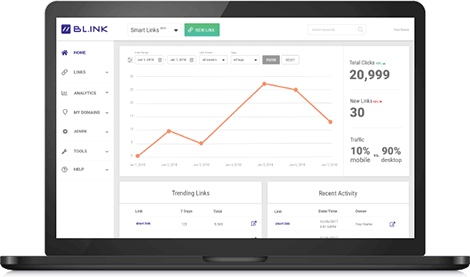 Their enterprise plan lets you brand as many links as you’d like and provides all the data and metrics mentioned above, which is best for large businesses who want to brand and track every link in their marketing campaigns. As one of the more robust link shorteners out there, Bl.ink offers smart branded links that allow you to create custom links that contain relevant words and not just a random string of characters. They also provide analytic reports that can track clicks by date, time, language, referrers, device, and location and integrate with web analytic tools like Google Analytics, Adobe, and others. Bl.ink offers four subscriptions tiers: a free plan, a plan for individuals and small teams with up to 15 users, a plan for teams and businesses with up to 50 users, and a plan for large organizations with over 50 users. Starting at $12 per month, they price their plans based off the amount of links you’d like create and track. For example, free users can create up to 1,000 links and track up to 1,000 clicks per link. After that, you’ll pay according to how many links you create and track. Trusted by over 250,000 customers, Rebrand.ly is a link shortener platform that can brand your links, track their performance metrics, or integrate with over 50 other platforms to seamlessly distribute your links. With two plans for individuals and two plans for teams, Rebrand.ly offers link shortening solutions for both small business and enterprise companies. For instance, their starter plan offers 50,000 tracked clicks, 5,000 branded links, and 5 custom domain names for $29 per month, while their premium plan offers 2,000,000 tracked clicks, 200,000 branded links, and 20 custom domain names for $449 per month. Developed by the social media management platform, Hootsuite, Ow.ly is a link shortener that’s included in every free Hootsuite account. With Ow.ly, you can distribute your links and track their performance metrics directly in the Hootsuite platform, which allows you to shorten every single link you post to all your social media profiles. 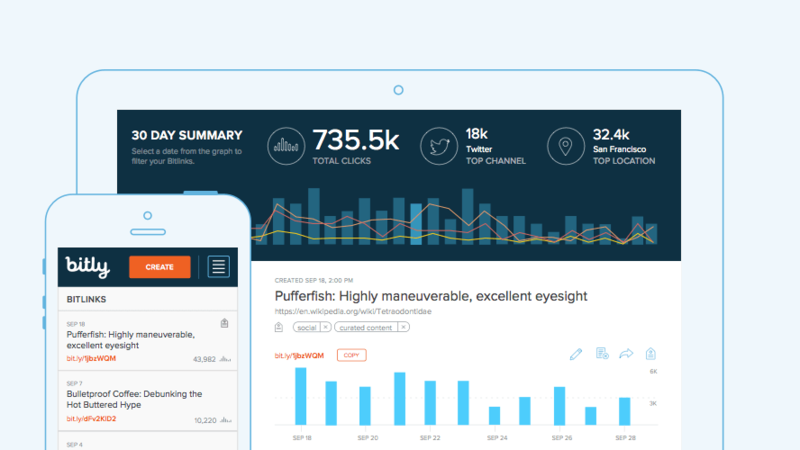 Ow.ly is best for anyone who already uses Hootsuite as their social media management platform. 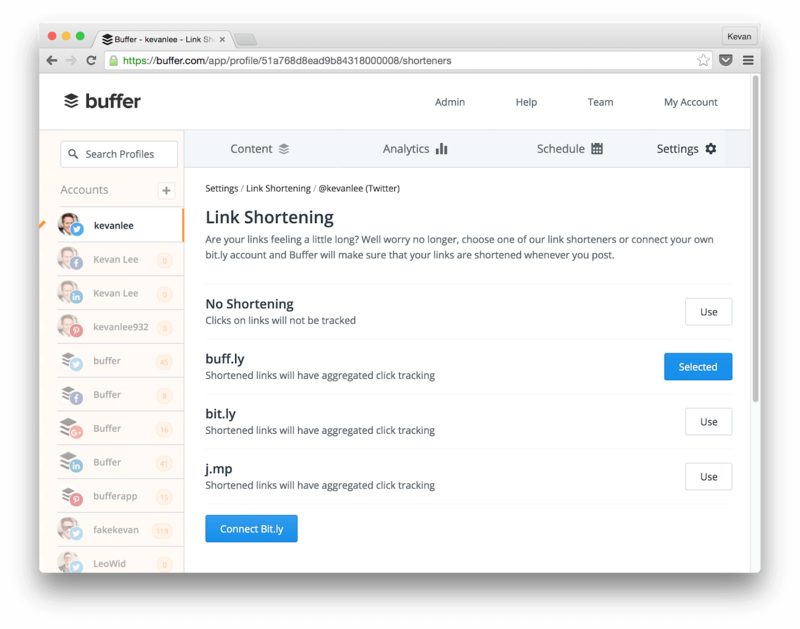 Similar to Hootsuite’s link shortener tool, Buff.ly is integrated in Buffer, another social media management platform. With Buff.ly, you can shorten your links, customize them, distribute them to all your social media profiles, and track their performance metrics right in the Buffer platform. Buff.ly is perfect for anyone who uses Buffer as their social media management platform.